"We are driven to make the world a better place, and it's a lot of fun," says David Day. The University of Florida has reaped more than $250 million in royalties over the last four decades from the sale of Gatorade, famously created by UF professor Robert Cade. But UF originally rejected Cade’s request to market the drink, and it took a legal battle after Cade sold the formula before UF reached an agreement to receive a share of those royalties. “Gatorade was kind of the big one that almost got away,” says David Day. Day is retiring after 16 years as director of UF’s Office of Technology Licensing, where his job has been to ensure that the big ones didn’t get away. UF is doing better than most universities. A study by the Milken Institute in April ranked UF third in the nation in “technology transfer,” turning research into products and businesses. During Day’s tenure, UF research has created 195 biomedical and technology startups and generated more than $1 billion in private investment. Day pushed the university to pursue startup businesses as a way to capitalize on its research, instead of licensing technology to large corporations. “I’ve always seen the necessity of doing startups. I’ve always seen the necessity of doing it well,” he says. 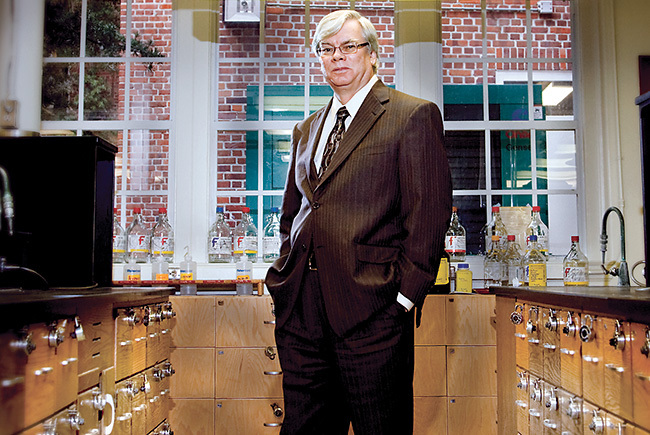 After retiring from UF, Day will stay involved in biotech startups as executive director of Southeast BIO, a non-profit organization that promotes growth of the life science industry in the Southeast. Day is hoping to attract venture capitalists away from the usual technology centers in Boston and Silicon Valley. “We’re going to make it easier for them to come see what’s happening in this region,” he says. Jonelle Toothman spent a decade working for medical device companies but found it unfulfilling. “The thing that frustrated me about large corporations is I saw good science die,” she says. Toothman wanted to start a company with new medical technology that could change patients’ lives, and found her answer in a process developed by former UF researcher Jamie Grooms that regenerates human tissue. The process allows patients to heal without scars. “I looked at the patent and fell in love,” Toothman says. Toothman co-founded NeXtGen Biologics and has raised $5.5 million, hoping to get FDA clearance to market the process by the end of this year. GAINESVILLE — Gray Television acquired Gainesville’s ABC and CW television network affiliate WCJB. Atlanta-based Gray paid $85 million to buy WCJB and another station in Bangor, Maine. Newell Hall, the University of Florida’s third-oldest building, reopened after a $15.5-million redesign that created a technology-rich learning center. The 36,000-sq.-ft. facility opened in 1910 to house the Florida Agricultural Experiment Station. After announcing plans last year to build a smaller 365 Whole Foods Market, the company instead is building a full-sized Whole Foods store at the Butler Town Center that will open in the fall. HAWTHORNE — Six months after the town’s only bank offi ce closed, SunState Federal Credit Union opened a branch in the Hawthorne Square Shopping Center. It is the 10th branch for Gainesvillebased SunState. JACKSONVILLE — After years of debate over its pension debt, the city council finalized a plan to reform its three public pension funds, which had been costing Jacksonville nearly 25% of its annual operating budget. The reform plan extends a half-cent sales surtax, which had a sunset date of 2030, until the pensions are fully funded. Sports apparel merchandiser Fanatics continued its expansion by acquiring the licensed sports group of V.F. Corp., including the Majestic brand. Terms were not announced. Rideshare company Lyft signed a one-year agreement to become the first transportation networking company to legally pick up passengers at Jacksonville International Airport. The Jacksonville Aviation Authority says it wanted to establish rules for companies like Lyft ahead of possible state or city legislation to regulate them. In its first home series since changing its name from the Suns, the Jacksonville Jumbo Shrimp drew 41,276 baseball fans over five days, the most-attended series in the ballpark’s 15-year history. Gate Petroleum is renovating a south Jacksonville building to create a “Gate University,” where the convenience store chain will train employees. Miami Subs, which closed its Jacksonville locations in the early 2000s, is returning to its fast-casual Miami Grill restaurants. Sears will not renew its lease on an 815,000-sq.-ft. warehouse in north Jacksonville. The building will be one of the largest industrial properties available for lease in Florida. Rand Worldwide acquired Jacksonville-based Advanced Technologies Solutions, which builds information modeling technologies and services. Terms were not announced. OCALA — A 2-year-old colt sold for a record $2.45 million at the Ocala Breeders’ Sales Co.’s spring auction. The previous record was $1.9 million. The spring sale brought in a total of $13.15 million for 143 2-year-old horses. ST. JOHNS COUNTY — County commissioners approved a plan to expand the RiverTown development along the St. Johns River from 4,500 residential units to as many as 4,950. In the works for more than a decade, the 4,057-acre development owned by Mattamy Homes held its grand opening this year. Commissioners approved a plan for St. Johns Development Partners to build a 175,000-sq.-ft. indoor sports complex and 125,000 square feet of commercial space in the northern part of the county. The recreation facility is to open in late 2018 or early 2019.